The public service minister is apparently ensuring excellent service – for herself. 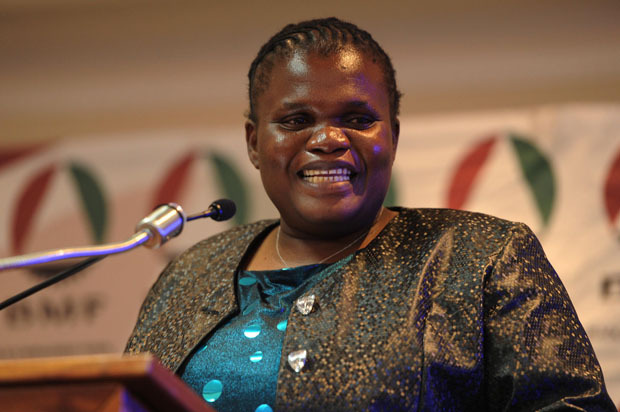 A report in the Sunday Times alleges that Public Service and Administration Minister Faith Muthambi has been employing friends and relatives from Limpopo without following due process. She has allegedly hired uncles and cousins as drivers, deputy directors and even a “food services aide” – a job no one even understands the need for. The ministerial handbook that she should be most concerned about implementing as public service minister limits the number of people she can appoint to 10, with two advisers – she’s currently on 27, according to the paper. They even reported that former SABC COO Hlaudi Motsoeneng’s 21-year-old daughter Lerato is now her admin assistant. She and Motsoeneng are firm friends who always defended each other when she was the communications minister. The paper also published a list of at least eight other people who were either family or friends and who she had recently employed as drivers, admin officers and deputy directors. Her new personal assistant, who used to be a constable and could now make R1.1 million a year, has no tertiary qualifications. Her spokesperson claimed Muthambi was allowed to make these appointments in the manner she had, and he cited the Public Service Act. She has also “blown” millions on “outreach programmes”. The Sunday Times clarified that the R300 000 it initially reported Muthambi had spent of taxpayers’ money to fly 30 family members to Cape Town last month to listen to her give a speech is probably more, at R500 000. The paper was advised by a source that there were additional costs for a trip to Robben Island, restaurant meals and hotel rooms. It had earlier been reported that Muthambi was not happy that her department’s then director-general, Mashwahle Diphofa, allegedly disagreed with her directives to fund her imbizos. She reportedly stripped Diphofa of his powers and brought in her former communications department chief financial officer to improve the ease with which state funds were reallocated from her department. The Sunday Times reported Muthambi has also sidelined the department’s official chief financial officer, Masilo Makhura. The opposition has described Muthambi’s practice of regularly funding imbizos as a shameless tactic to divert public funds to ANC electioneering events, which she became known for in her previous stint as communications minister. She has now spent as much as R3 million on these events in her new portfolio. When Diphofa allegedly told her she was abusing her budget and would run out of money by September, insiders told the paper she revoked his duties.